See my post The New & Less Traveled Oslo for even more suggestions. We’ve been here several times. It never gets old. It’s a great outing for adults and kids alike. It begins with a very scenic t-bane ride (public transportation via train) on Line 1 to the stop Holmenkollen, followed by a 10-minute walk. 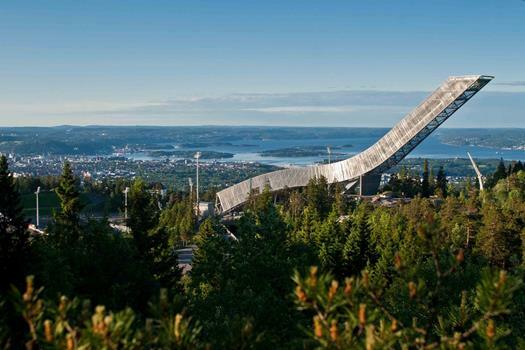 Your visit to the top of the ski jump tower will take you through The Ski Museum first (the world’s oldest museum specializing in skiing where you can experience 4000 years of exciting ski history through various exhibitions) before heading up to the top for stunning panoramic views. When you’re ready to go back down, you can backtrack the way you came OR you can experience what it’s like to jump from the tower by trying Kollensvevet, Holmenkollen’s zipline. Or maybe abseiling/rappelling is more your thing. While in the area, you can also experience a thrilling ride in a ski simulator, climb a huge troll statue, or even play some frisbee golf. There are also plenty of geocaching opportunities for those who are interested and have the time. 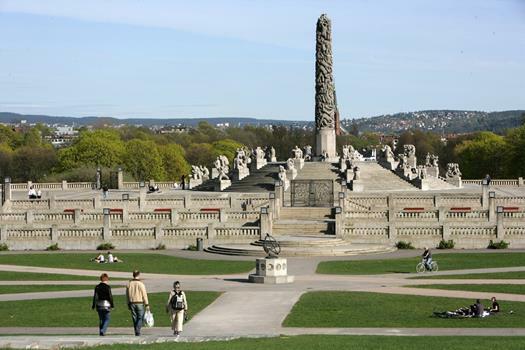 Frogner Park is a fun and relaxing park to stroll through. 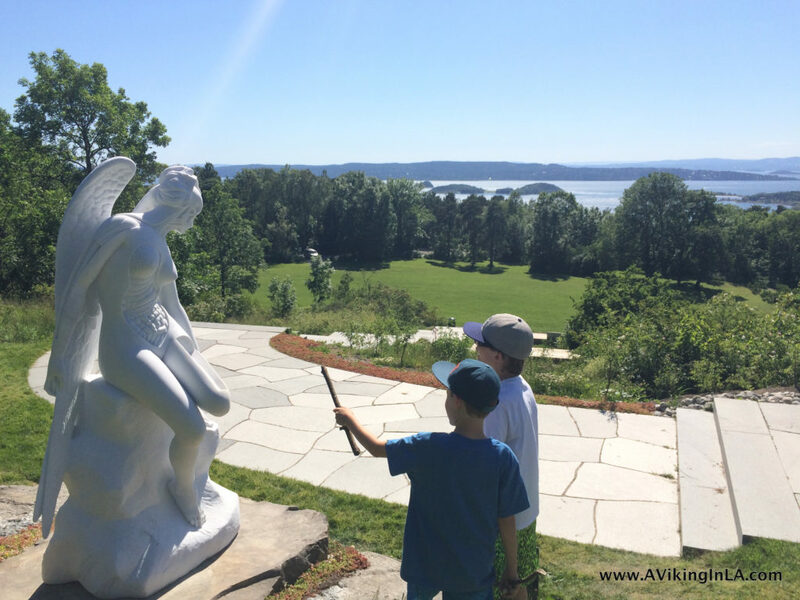 It has lots of interesting larger than life-size statues in bronze, granite, and wrought iron by the artist Gustav Vigeland (1869-1943). Be aware that most of the statues are naked people, which my kids have luckily gotten over. There are no gates nor rules against climbing on the statues so kids (and adults) get a kick out of that. There’s a large playground for kids near the main entrance. My parents live just down the street from this park so we visit frequently. 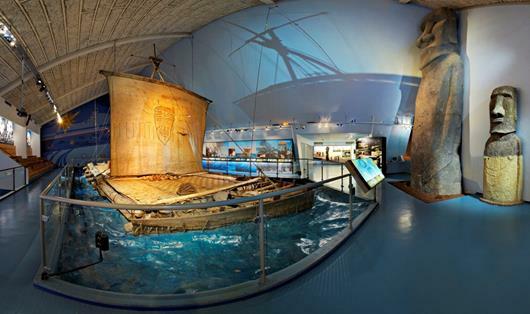 The Kon-Tiki Museum chronicles the work and adventures of Thor Heyerdahl (1914-2002), one of the world’s most famous scientists and adventurers. Maybe you saw the Norwegian movie that was released in 2012 and nominated for an Academy Award? The museum is small and interesting to kids, too. You can get up close to the Kon-Tiki raft and the undersea view of it is very impressive. And there is a huge cave in the basement that’s fun to explore as well. The museum is located on the island of Bygdøy. I recommend taking a ferry from the wharf near City Hall. 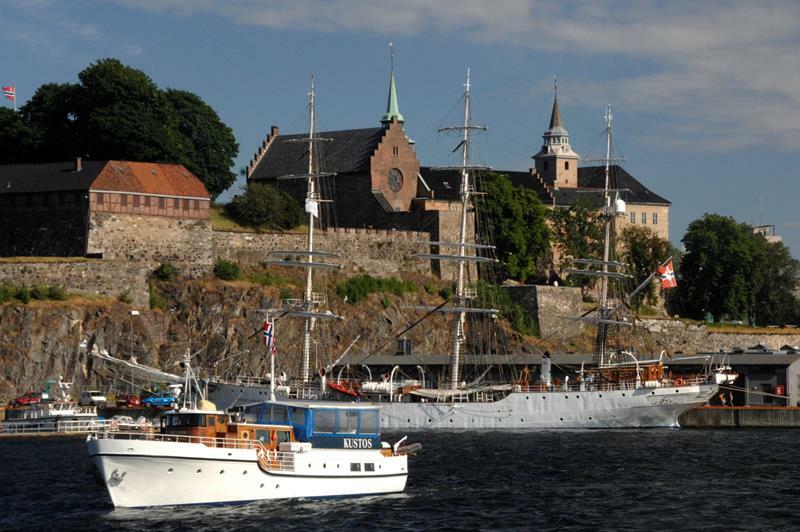 If you have the time and the kids are amenable to the idea, you can visit the Fram Museum which is directly across from the Kon-Tiki Museum. 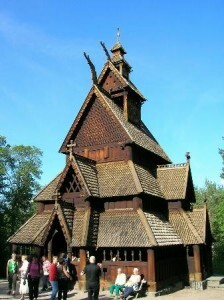 (If you are short on time or patience, I would give the kids an ice cream and head to the Viking Museum instead.) 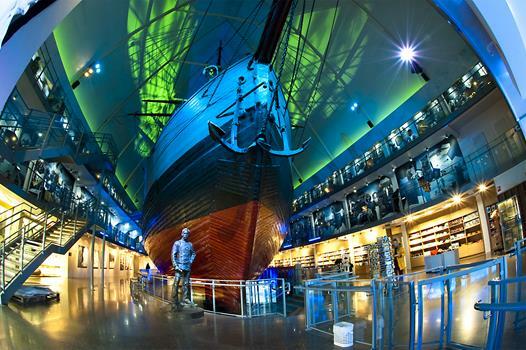 The Fram Museum is home to the world’s strongest polar ship, the Fram, and tells about Norway’s famous polar explorers. You can board the ship and take a look around in the cabins, lounges, cargo hold, and engine room. When in Oslo, you can’t not see the Viking ships! 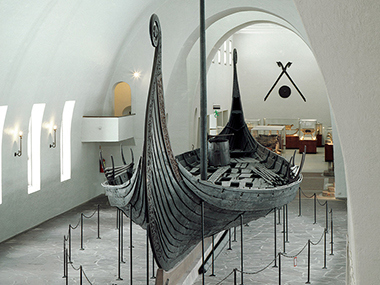 The Viking Ship Museum is about a 15-minute walk from Kon-Tiki and Fram. This is another small and very manageable museum. It used to be that the main attractions were three Viking ships, one of which is completely whole, along with a display of Viking Age artifacts. Now, there is a new attraction: the film Vikings Alive. It’s a film that takes the audience on a unique visual journey into the history of a Viking ship. A Viking ship is built and sails along the Norwegian fjords and on the ocean, ending its days as a grave ship for a king. The film is projected onto the vaulted ceiling of the museum. Unlike the other museums nearby, this one requires more time to be enjoyed. It is located around the corner from the Viking Museum. The Folk Museum is Norway’s largest museum of cultural history and features the world’s oldest open air museum. It presents daily life and living conditions in Norway from the 16th century to the the present. Hosts in traditional folk dress greet you, and during the summer, there are different activities every day. Don’t miss the stave church from 1200. 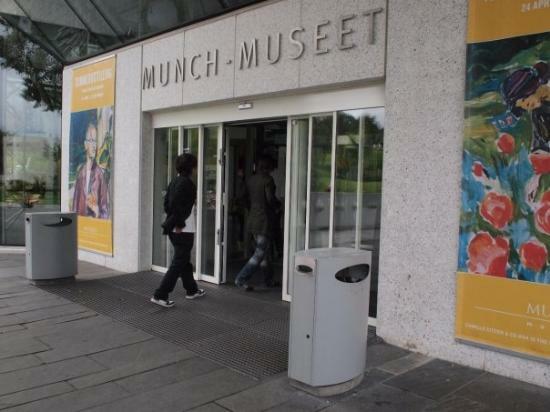 The Munch Museum is an art museum in the Tøyen district of Oslo dedicated to the life and works of the Norwegian artist Edvard Munch. It is a very manageable museum to visit, and they even make it fun for kids to explore the museum by providing a game for them. In Picture Hunting, kids are given details of paintings and are challenged to find the paintings themselves. We never miss going to Aker Brygge during the summer. It is a bustling commercial area along the Oslo Fjord waterfront with lots of restaurants and shops. We’ve gone during the day with the kids and bought ice cream and found a place to sit and relax while enjoying life around us and the beautiful weather (because you wouldn’t want to come to Aker Brygge during anything but beautiful weather). There’s even a play structure for kids here. And we’ve gone at night time with friends and enjoyed a dinner at an outdoor restaurant. Two notable attractions in the Aker Brygge area are the Nobel Peace Center and Astrup Fearnley Museum. 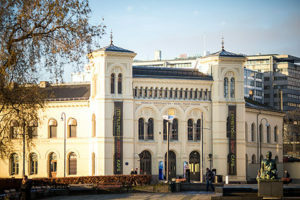 The Nobel Peace Center has a permanent exhibition about Nobel Peace Prize laureates, plus temporary exhibitions on other various themes. There are also special activities for children. 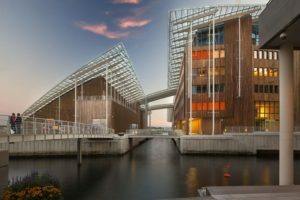 The Astrup Fearnley Museum, which moved to Tjuvholmen in 2012, presents temporary exhibitions of international art and houses the Astrup Fearnley Collection, one of Norway’s most important and most extensive private collections of contemporary art. The Opera House is a somewhat recent addition to the Oslo cityscape. It was completed in 2008. It is located right along the harbor and has a roof that angles to the ground allowing visitors to walk up and experience panoramic views of the surrounding scenery. 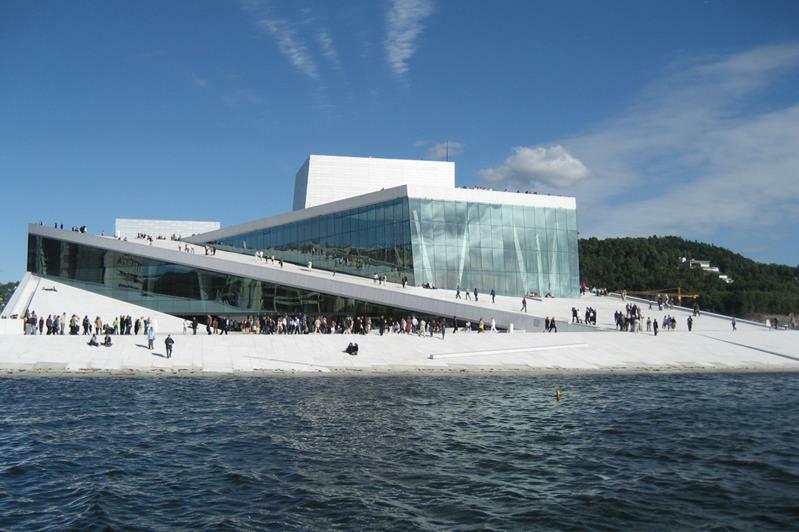 The Opera was designed by the Norwegian architecture firm Snøhetta, which is also responsible for many forward-thinking structures around the world, including the entry pavilion of the National September 11 Memorial Museum in New York and the addition to the San Francisco Museum of Modern Art in California. If you’re interested in seeing more of the Opera House or learning about life in the Opera House, you can join a 50-minute guided tour and learn about the architecture, stagecraft, opera, and ballet from knowledgeable tour guides. You might even have a chance to walk out onto the Main Stage, visit the costume workshop or scene painting room, or possibly even meet a singer or dancer as you make your way around. Make sure to check their website for current details on when English guided tours are available. This is the main street in the center of Oslo. It connects Oslo Central Station, the main railroad station in Oslo, and the Royal Palace. Part of it is pedestrian. The whole stretch is filled with shops and restaurants. Along Karl Johans gate, as you approach the palace, is Eisdvoll plass (Eidsvoll Square) and a park with statues, pools, and fountains (which during the winter becomes a skating rink). The Norwegian Parliament Building (Stortinget) is on one end of the square and the National Theater (Nasjonalteateret) is on the other end of the park. Opened in September, 2013, this large wooded park with panoramic views of the city is not just a sculpture park but also a national heritage park. While wandering along the paths, you come across both art sculptures and historical markers. The sculptures are representative of European art history from the last 130 years. So far 35 sculptures have been erected with more to come. The historical markers point out such things as burial sites and stone circles from the Iron Age and explain how the area was used during wartime (Nordic Seven Year War, 1563-1670, and World War II). Ekebergparken is always open and free to visit. The park has several food and dining options including Ekeberg Restaurant, Karlsborg Spiseforretning, and the outdoor seating connected with Lund’s House. In Lund’s House, you will find a small museum of history and nature and the museum’s art and design shop. 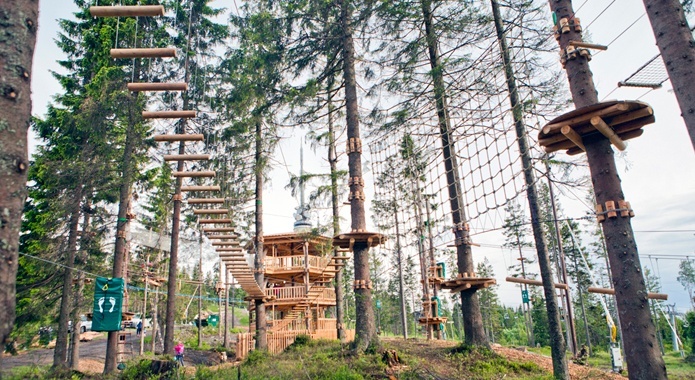 There is also a small climbing park for kids outside Lund’s House. This is a place we enjoy visiting year after year. You get a helmet and a harness, go through an orientation, and then you’re on your own to explore the ropes courses through the trees. Height determines which courses you can go on. We first went when my youngest was five years old. 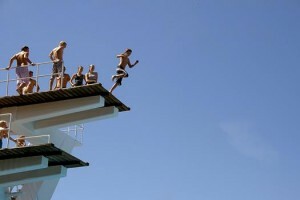 Even the courses that he could go on were fun, and at times challenging, for me, too! There are all sorts of challenges along the way, including zip lines, and you enjoy amazing views into the surrounding wilderness. You could spend hours here; we did and got phone calls from the grandparents wondering when we’d be coming home. The Norwegian Museum of Science and Technology is very kid friendly. It has exhibits about energy, oil and gas production, medicine, music, airplanes, cars, and trains. There’s a planetarium and a robot center. It has many hands-on activities and exhibits. 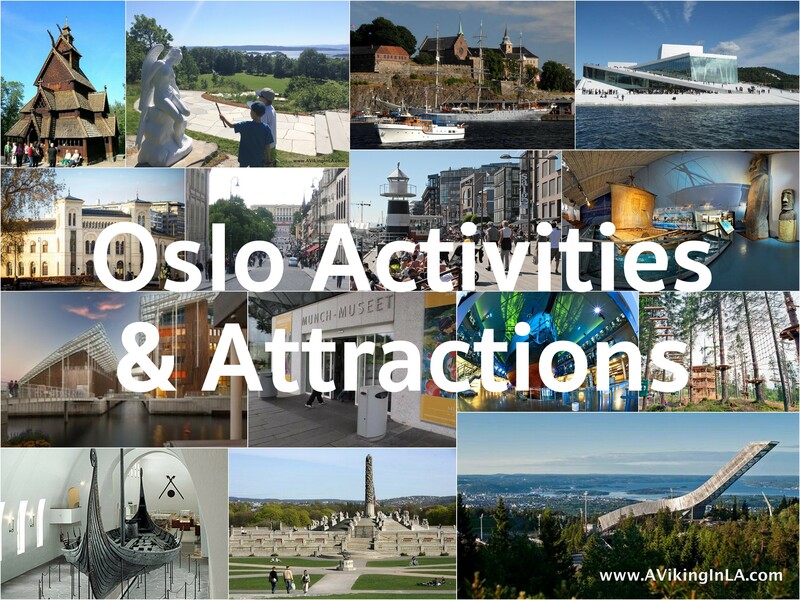 Though not on my list of must-dos if you only have a couple of days in Oslo, it is certainly worth a visit if you have an extended stay in Oslo. During an extended stay in Oslo, you can also visit Frognerbadet, an outdoor public swimming establishment in Frogner Park, and TusenFryd, an amusement park about 12 miles from the center of Oslo. For more suggestions, see my post The New & Less Traveled Oslo. The Oslo Pass is a good idea for tourists who are in town for a short period of time and wish to visit many sights. 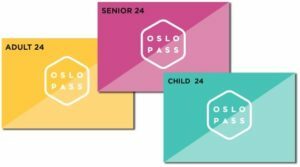 With the Oslo Pass, during a predetermined time period of your choice (24, 48, or 72 hours), you get free entry to more than 30 museums and attractions, free travel on all public transport, free parking in municipal car parks, free entry to outdoor swimming pools, free walking tours, discounts on sightseeing, ski simulator, Tusenfryd Amusement Park, concert tickets, climbing, ski and bike rental, and special offers in restaurants, shops, entertainment and leisure venues. I wish you a spectacular visit to Oslo! Hi there!!! Thanks a lot for these tips!!! And greetings from Brazil!!!!! I’m glad I could be of help. Have a great trip! Oh, those are some of my favorite Oslo sites too! 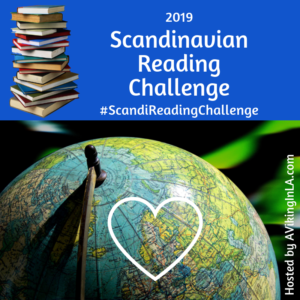 Like you, I spent my early years living in either Norway or the U.S. through different stages of my childhood. 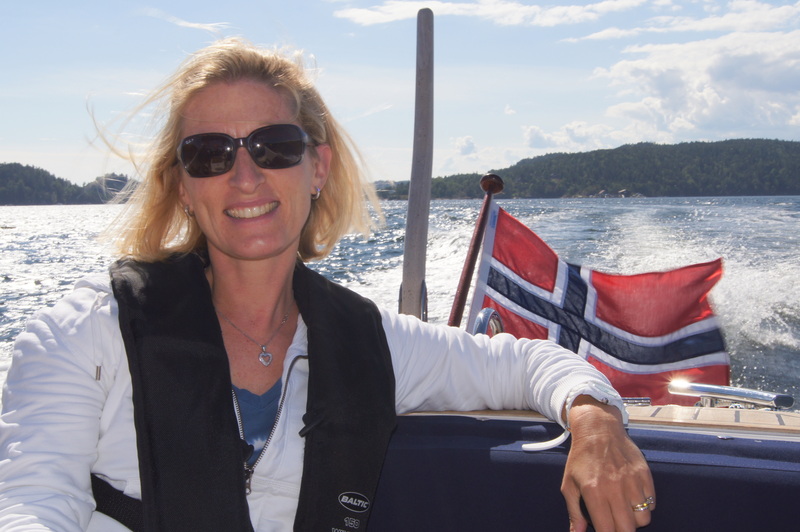 Somehow I ended up in the US as an adult, but the memories of Norway linger. I am definitely still Norwegian, although my family in Norway now introduces me as their American relative! Thanks for stopping by and commenting. I’m always happy to connect with people having a similar background to mine! Kunne tenke meg å prøve noe av det selv også! Wow! Imponerende 🙂 jeg er helt enig med alle stedene du har beskrevet, og hvis jeg skulle tilføye noe, ville det være å ta en av fergene ut til hovedøya (eller noen av de andre små øyene i oslofjorden) der kan man gå tur blandt gamle klosteruiner, ha piknikk ved stranden, bade, grille etc. Veldig fint når det er pent vær. Carine og jeg tok med oss Sophia og Nina for flere år siden (da Nina var baby) så det går fint å ha med barnevogn. Det høres kjempe hyggelig ut! Det er kanksje noe jeg kan prøve i år med guttene. Takk for forslaget! This is amazing and so helpful! Thanks! I enjoyed putting it together. Thanks for the inspiration! Have a fabulous time!